On March 5th, 2011 Womack walked for MDA once again in the Dallas, Fort Worth Muscular Dystrophy Association's 8th annual "Muscle Walk". Early that morning, some 3,000 family members and friends of MDA patients walked or rolled through the new Cowboys Stadium in Arlington to raise money for patient care and research. Music and lyrics for this video were written by Magical Garden, a musical collaboration between Kimberly Sudderth and Claus Wissler. The song "This is our Time" was released internationally in January 2011. 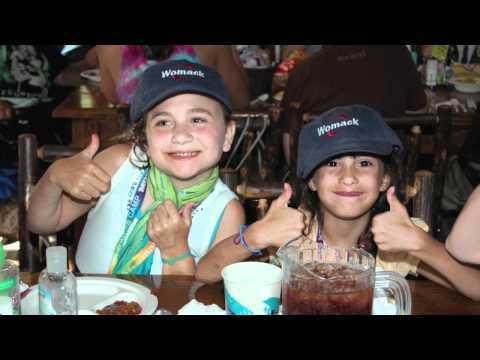 The Womack Walks for MDA team is dedicated to funding MDA summer camp. This specially equipped facility provides an opportunity for 100 kids to enjoy a week of swimming, fishing, horseback riding, crafts, and campfires. Camp is a dream come true for these boys and girls. A place where they can overcome the limitations of their desease. If you were kind enough to help us this year, or in years past, or if you simply remembered our cause with your thoughts and prayers, we thank you. We simply couldn't help the kids without you.